Honestly I looking back on a photo taken just two days ago after getting my hair done I wanted to experiment with two of my favorite MAC lipsticks. I doubt I am the only one always wanting to find the perfect shade of lispticks. 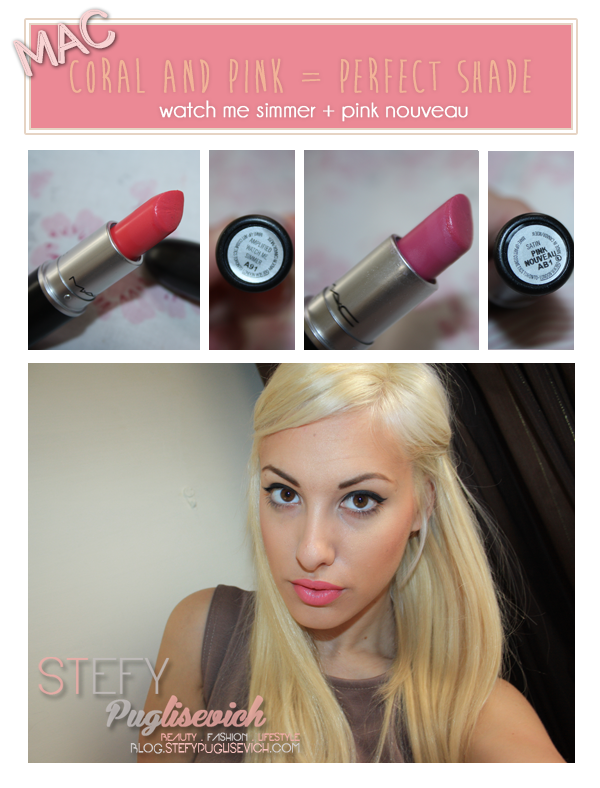 Watch me Simmer is probably my favorite coral summery lipstick to date and being an amplified lipstick the pigmentation of this lipstick is amazing. I can never complain with these lipsticks as the staying power is always great. Mixing that with Pink Nouveau, I got this gorgeous Plum pink coral that I instantly fell in love with. This is a colour I would like to get my hands on without mixing two lipsticks together. Hopefully MAC will have a lipstick similar to this shade for me to grab! Im still looking for the exact shade in one lipstick! It's the only thing that im upset about i wish they stop! Love that color! Perfect for this time of year!